Oh boy! 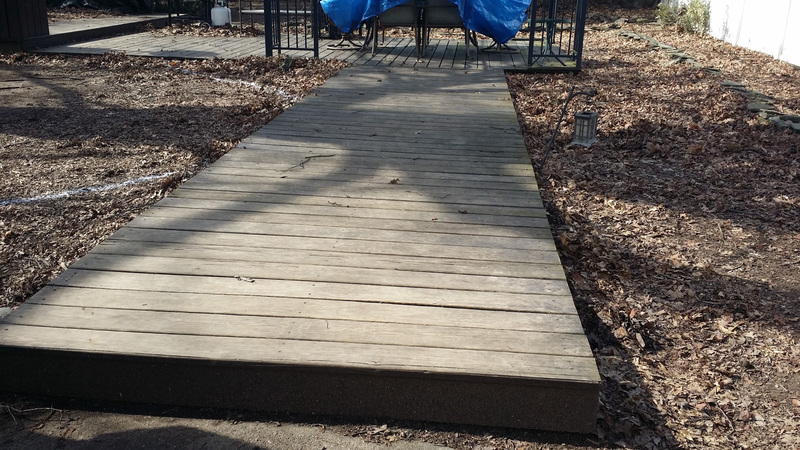 When I first espied this back yard I thought of the show Ancient Aliens. What happened here? Who did this? How did they do this? Why did they do it? Are they doing this somewhere else again? 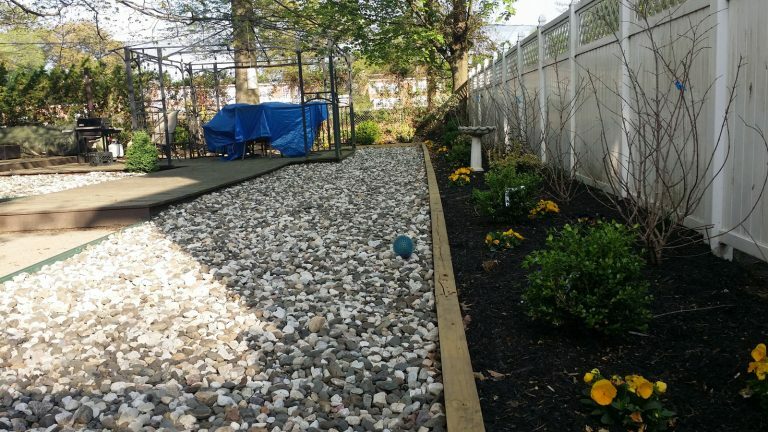 As you can see from the pics this particular yard needed a major overhaul. The challenge in front of us was how can we create something unique with such a low canopy of tree limbs to work beneath. 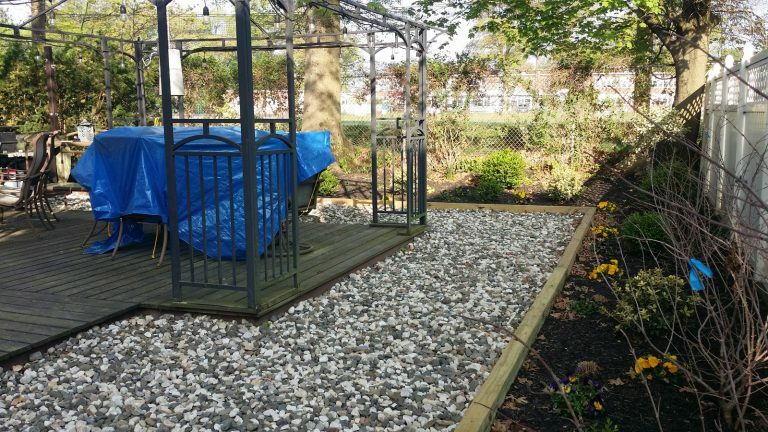 The existing landscape beds were undefined, there was bare uneven ground between a deck walkway leading to a deck area and what was supposed to be a landscaped bed along the fence. 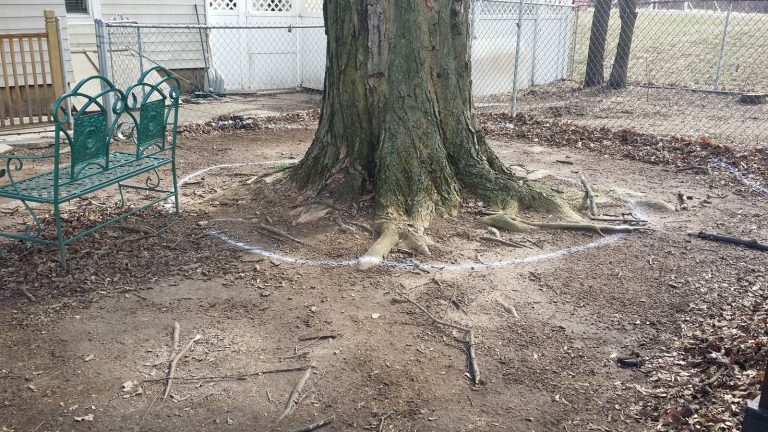 There were two trees that had roots growing and breaking the ground surface, making walking around unsafe and there was overall no visual appeal to the property at all. 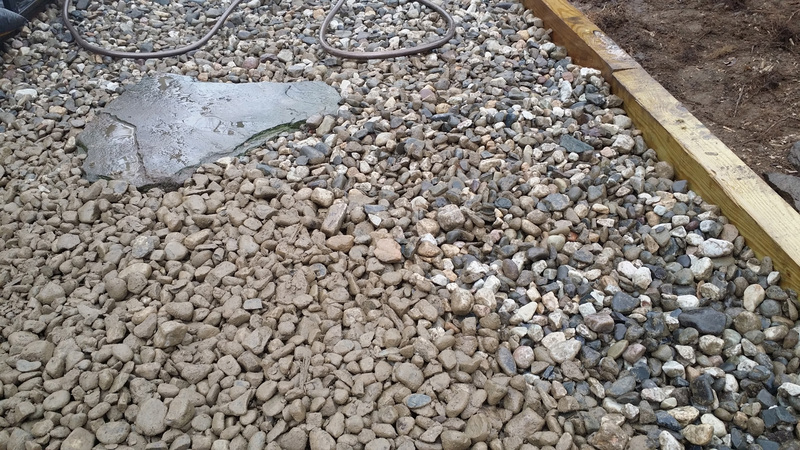 Closeup showing the decorative stone chosen for the ground covering mulch area. The other factor that was discussed with the client was how can we create a place that the large dogs would not destroy while incorporating the already existing deck and outdoor living area into the design? 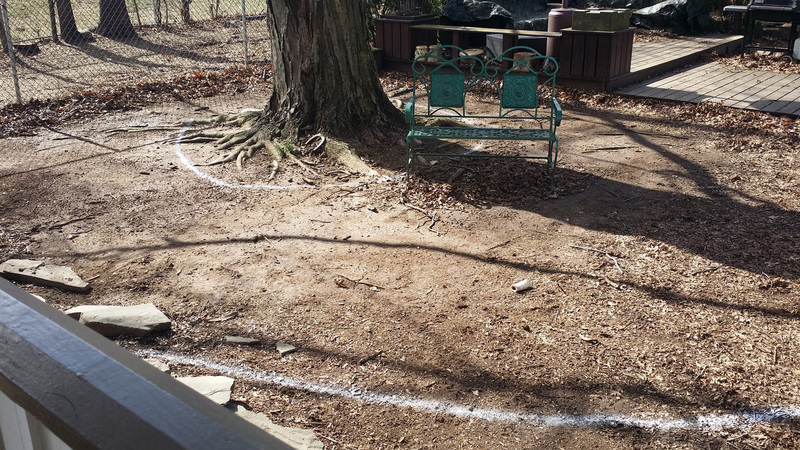 We first addressed the bed layouts by defining the planting area along the fence and also those surrounding the two trees. As edging we utilized pressure treated 4”x4”x8’ lumber. 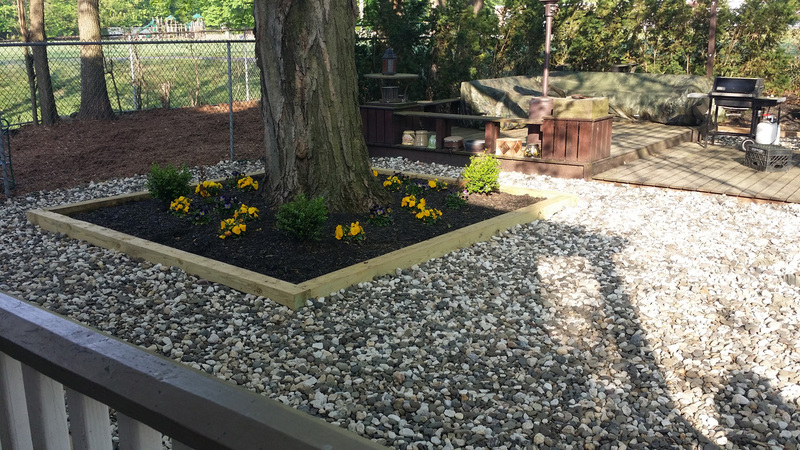 We created two boxed raised beds around the trees. 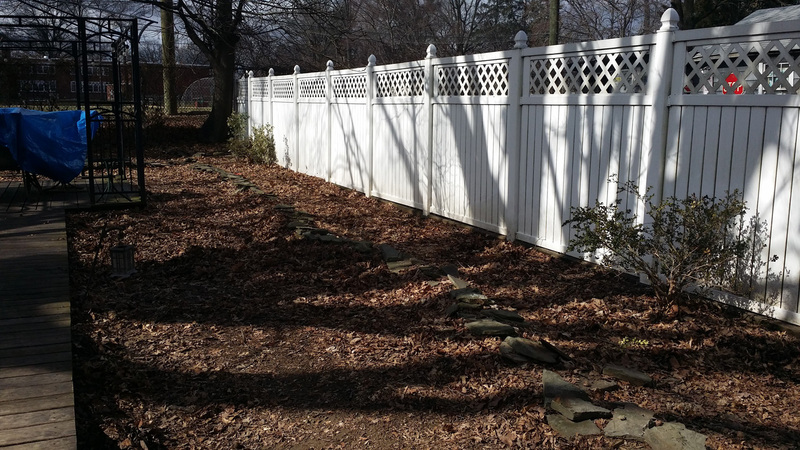 We then created a screening along the white fence with a native planting of Red Twig Dogwoods. A fast grower, cornus sericea – red twig dogwoods grow to a height of 8 feet with a spread of 5 to 6 feet. During the summer they provide a visually appealing screen of foliage but during the autumn and winter their foliage is a spectacular display of fiery reds followed by flaming stems through the winter months. 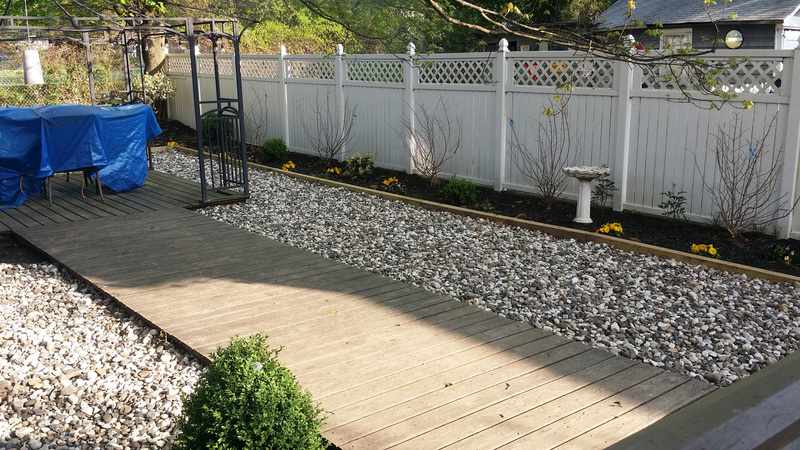 To the forefront of this bed we spaced lower growing ilex steeds for year round color and foliage. Steeds ilex is perfect for accenting an area while making a hedge with a shape that is easy to maintain with minimal pruning. We then planted seasonal color to complement the reds and green of the screening plants. 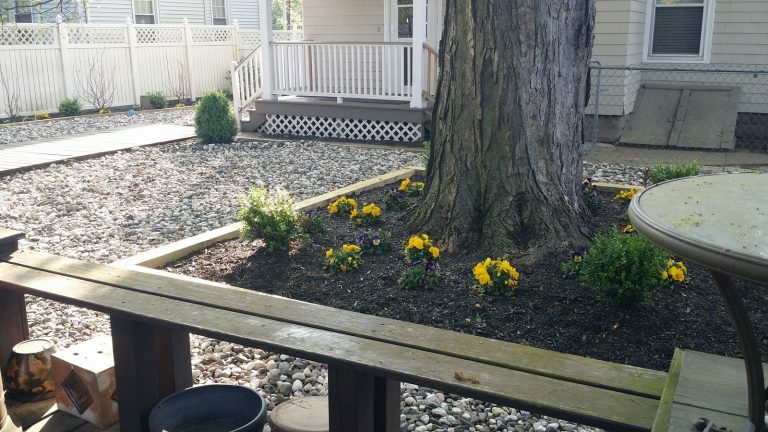 Within the two tree raised beds we planted boxwoods accented with seasonal color again for year round visual appeal. 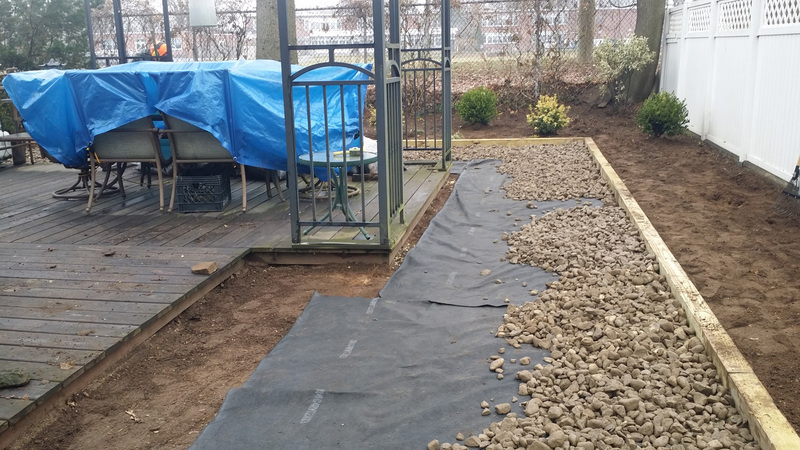 The bare soil area that lies between the beds and the outdoor living area/deck and also encompassed the two large shade trees we addressed by installing a layer of weed mat upon which we utilized a white decorative river rock. 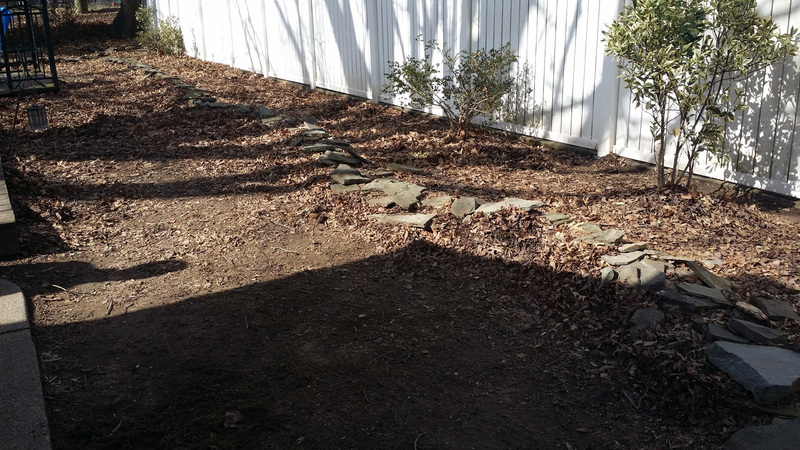 Doing so not only made the entire back yard visually appealing but also added safety by addressing the problem with the tree roots, now non-existent. 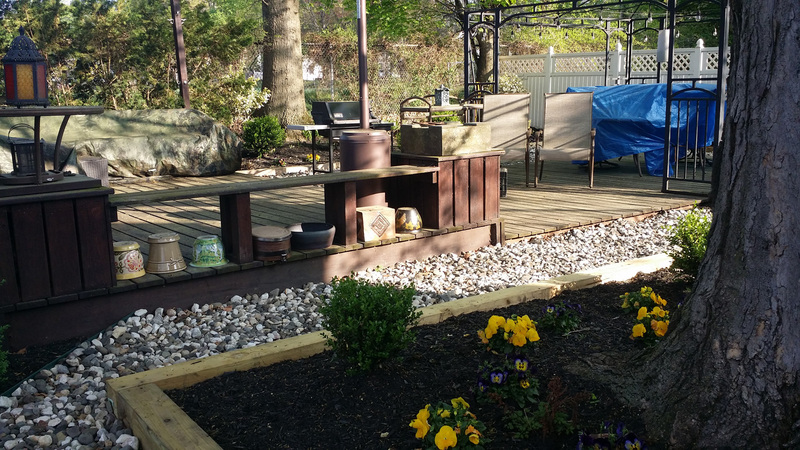 For more information about Privacy Screenings with Plants visit our Plants for Landscape Screening Page where you can find detailed information on specific plants for privacy screenings.